Vidmap: Customizable embed code for your Vidmaps! 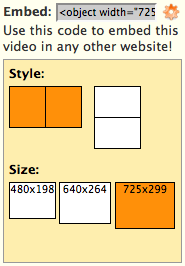 Customizable embed code for your Vidmaps! Today we launched a brand new feature on Vidmap: customizable embed code! From now on everyone can easily adjust format and size of the vidmap to embed - without touching a single bit of code anymore.